Scouring the internet for information and reviews about which ballooning company to book in Bagan (there are 3 right now), I decided to go with Oriental Ballooning as they had fewer passengers per balloon that meant we didn't have to worry about somebody blocking our view or anyone looking over our shoulders. Plus the company has very good feedback from their customers. Oh! And did I mention their balloons are green? It was still pitch black when we arrived at the launch site (good thing we brought flashlights!). We were then led to some chairs and tables and served a light breakfast of coffee and sweet rolls while waiting for the other passengers to arrive. Farther afield, we could see a lot of activity going on and felt another burst of excitement for the upcoming ride (pun intended). After an introduction of the pilots and a roll call of all passengers (no stowaways here! ), we were given a safety briefing and told what to expect during the flight. We were all each assigned to a pilot and led to our respective balloons. Another safety briefing by our pilot, Piers, was done while waiting for our balloon to be inflated. As soon as the balloons were up, we were asked to clamber into the basket. Great profile shot of my favorite subject if I may say so myself. It was one exhilarating ride! Absolutely fantastic! The Big K and I couldn't stop oohing and aahing the entire time. Hmmm.... Wait a minute. Remind me again, who didn't want to go on the balloon ride? A little over an hour from our launch we were slowly descending back to earth. Now here comes the tricky part. According to our pilot, he has to find a suitable landing site that his ground crew can easily get into. We didn't want to end up in a fenced off area, would we? In a short while Piers calls out to brace for landing. Landing position everyone! After a couple of bumps and a shower of dust we were on solid ground once again. Perfect landing! After a champagne celebration and our certificates on hand, we were brought back to our hotel. Just in time for second breakfast! Okay, now back to pedal power! 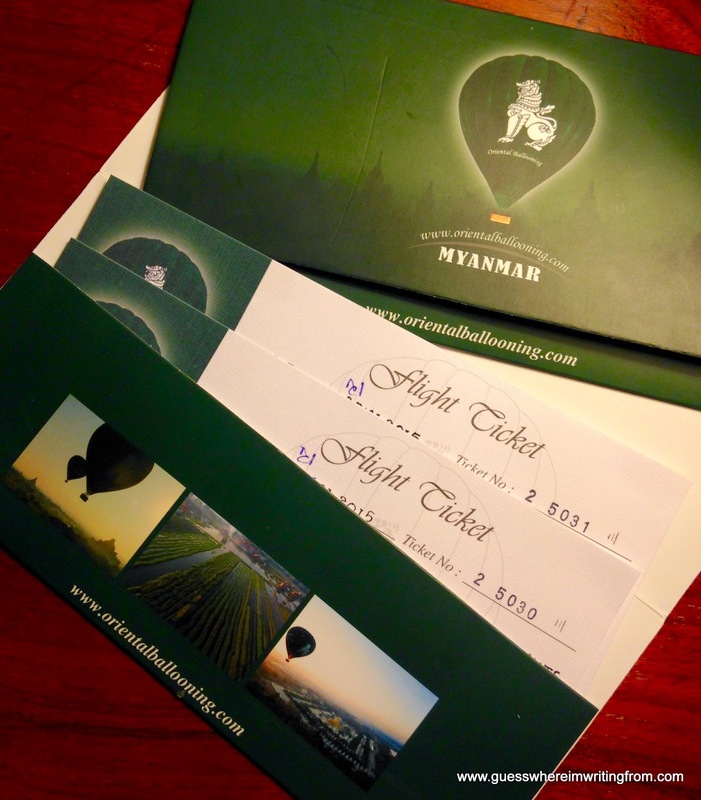 Experience hot air ballooning in Myanmar with Oriental Ballooning.